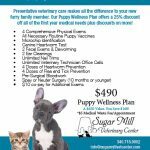 Sugar Mill Veterinary Center is a state-of-the-art, eco-friendly, full-service companion animal veterinary hospital providing excellent and comprehensive medical, surgical and dental care for your pet. Sugar Mill Veterinary Center was officially opened in December 2008. The Inn at Sugar Mill opened in May of 2009. We expanded the inn to include additional kennels in the renovated Sugar Mill in 2011. Sugar Mill Veterinary Center combines a holistic approach to pet wellness with a state of the art and environmentally friendly facility. Sugar Mill Veterinary Hospital is conveniently located off the Northside road in La Grande Princess, (on the same road with the Hibiscus and Palms hotels) before the turn into the road to Manor School. Just look for the Sugar Mill at the top of the hill! Emergency cases shall always receive top priority, which is why occasional appointment delay is inevitable. Please realize that we make a sincere attempt to see each client on time. For your protection, and that of others, all dogs must be on leash and properly controlled while in the waiting area or exam rooms. All cats must be presented in an appropriate cat carrier or on leash. Though we make every effort to make our patients feel comfortable during visits, they may be a little uneasy about new people, new surroundings and other pets. This is one of the reasons we ask you to restrain your pet. We require payments in full at the time that services are rendered. We accept Visa, Mastercard, cash and personal checks. We do not collect or give out any information to any third party vendors or internet businesses. It’s that simple! And we strictly adhere to this policy. Sugar Mill Veterinary Center recognizes the importance of protecting the personal privacy of its clients, its patients and those individuals who simply visit our site.